14-Day Free Trial. Only $9.97 per month. Free activation. No Contract. Autobrain turns any car into a smart car in minutes, so you can have peace of mind knowing that whoever is behind the wheel stays safe, whether it is your parent, teen, or spouse. Just plug the Autobrain device directly into your cars diagnostic port (usually under the steering wheel) and open up the app on your smartphone, tablet or computer. 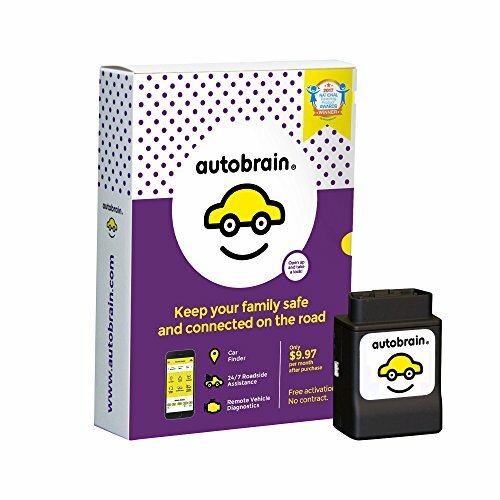 With Autobrain, you will have access to the most complete set of safety alerts and features available, including real-time vehicle location, vehicle diagnostics and mechanic helpline, 24/7 roadside assistance, trip reports, speed and location alerts, curfew notifications, emergency crash response and even a backseat-baby reminder. The Wirecutter, a New York Times publication, named Autobrain the "best OBD device for monitoring drivers". Car Finder - Locate your car in real-time from your smartphone, tablet or computer. If you have any questions about this product by Autobrain, contact us by completing and submitting the form below. If you are looking for a specif part number, please include it with your message.